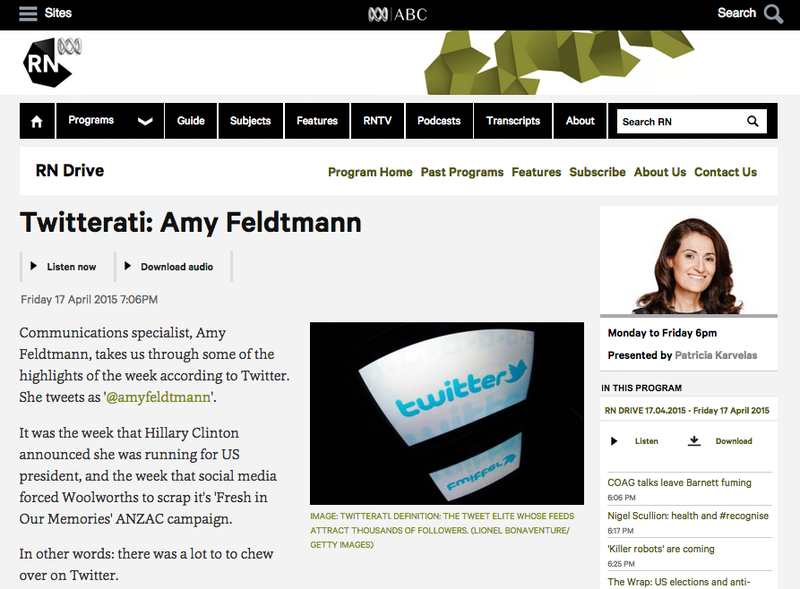 Last night I was on the ABC Radio National ‘Twitterati’ segment to discuss notable topics that were discussed on Twitter during the week. The interview covered Hillary Clinton, the Woolworths ‘Fresh in Our Memories’ ANZAC campaign, ‘selfish rabble’ protestors, and the NCDFREE public health organisation (The ABC is Australia’s national broadcaster, with television, radio and online news; and not to be confused with the ‘ABC Television Network’ in the U.S.A.). It was chat with their fantastic host Patricia Karvelas and you can listen to the short eight-minute interview at the ABC website.